So passes another Robin. Damian Wayne, slain in the pages of Batman Incorporated #8 has left a large hole in Bruce Wayne’s life. Peter J. Tomasi & Patrick Gleason’s series Batman & Robin takes the full brunt of the fallout, exploring how Batman is coping with the loss of his biological son – but this issue is different. Batman & Robin #18 has not one line of spoken dialogue, leaving most of the burden up to Gleason’s art, which thankfully delivers on an issue that is full of emotional impact as Batman spends his first night in the aftermath of losing his Robin. 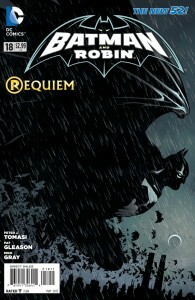 This issue shows how Batman grieves the only way he knows how- by burying himself in his work. Bruce takes to the streets of Gotham with the rage and determination of a man who has lost almost everything, and he becomes particularly violent in this case. The anger that Batman shows, which was previously reserved for only his most dangerous nemesis, comes out in full form as he appears to have his most eventful night. It’s dark stuff, and it seems that this may be the one event that could push Batman over the edge, which provides an interesting set-up for how the future of Batman comics could play out. Where this issue really shines is when the action takes a break and the family is left to think. From the opening pages where Alfred allows himself a moment of tears, before straightening up as Bruce walks into the room, through to any time Batman looks over his shoulder expecting to see his son beside him – each of these actions speak louder than any line of dialogue could. It’s a great touch leaving out any spoken words, and shows that words could not even describe the pain that the family feel. Gleason really goes all out with his art in this issue, as he manages to capture the full emotional impact of the grief. While some of his character work appears to look more like mannequin than human, this issue boasts some particularly stand out panels, such as what appears as the last image (for the time being at least) where we see both Batman and Robin together. It’s obvious that Gleason enjoyed drawing the Boy Wonder, and this panel is particularly impressive, as he manages to capture the spirit of Damian Wayne’s Robin – it serves well as a one last hurrah. Batman & Robin #18 says goodbye to Damian Wayne in a way that is wholly unique. It’s incredibly sad to see one of the more intriguing Robins in recent memory pass, especially considering his relationship with his father was finally reaching a point of normality within this title. It’s emotional and heavy, and as the final pages play out, as the impact of the event finally hits, you’ll find yourself in a similar state of mind.